WINONA, Minn. — The Page Series at Saint Mary’s University of Minnesota will present Virginia Repertory Theatre on Tour with a relaxed performance of “Harriet Tubman and the Underground Railroad.” This stirring drama, written by Douglas Jones with music by Ron Barnett, is a classic tribute to the great American who freed herself and hundreds of her people from the bonds of slavery. The nation’s second largest touring company for young audiences will perform at 6:30 p.m. Wednesday, Feb. 20, in Saint Mary’s Page Theatre. As Tubman and her friend, Sarah Bradford, narrate her adventurous life, the audience will share in the joys, sorrows, and challenges faced by Tubman, who changed the world through her courage. This deeply moving musical history lesson is inspiring, heart-warming, and comical while also full of the good humor, determination, and charity of its subject. The audience will find a new appreciation for Tubman and a deeper understanding of her times. 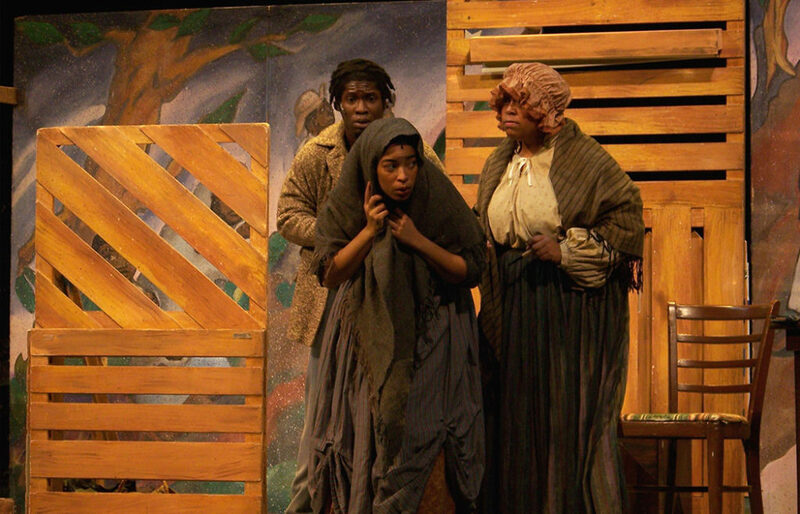 The production is based largely on Bradford’s book, “Scenes in the Life of Harriet Tubman,” and does contain a scene in which Tubman is the victim of discrimination through use of a racial slur. The company explains, “The playwright made a conscious decision to include this scene because it is historically exact, and it is an illustration of the degradation and humiliation African Americans endured even after emancipation.” Audiences are invited to read more about this scene and use of historically accurate language in the program note, “Why We Say It,” which can be found at pagetheatre.org. A performance guide is also available to help families prepare for the performance and learn more about Tubman. This will be a relaxed performance with limited sound and lighting effects. There will also be flexible seating options to provide for sensory needs or wiggle room for children. Page Theatre staff are available to assist patrons in setting up their orders and will work to accommodate special requests or considerations. Running time is approximately one hour, and the production is open to the public and recommended for children in grades three and up. All tickets to this performance are offered on a pay-what-you-can basis, thanks to the support of WNB Financial. For more information or to order tickets, visit pagetheatre.org or call the Performance Center box office at 507-457-1715 (noon to 6 p.m., weekdays). The Page Series will also partner with the Winona County Historical Society and the Winona Public Library for a Gathering at the History Center on Saturday, Feb. 16, at noon. The event will feature story time and a lesson on freedom quilts with members of the Winona Area Quilters Guild. Attendees will be invited to create a paper quilt square that can be added to a community-generated “freedom quilt” that will be hung in the Page Theatre’s Ben Miller Lobby during the performance. This event is free and open to participants of all ages. Virginia Rep on Tour, founded in 1975 as Theatre IV, has been internationally acclaimed for excellence as a theatre for young audiences. On Feb. 1, 2002, Virginia Rep on Tour’s production of “Buffalo Soldier” was performed, by request, at the Pentagon to open their celebration of Black History Month. The company performs live for more than 500,000 students, parents, and teachers each year throughout 33 states and the District of Columbia. Now in its 32nd annual season, the Page Series connects professional performing artists from around the globe with thousands of Winonans each year. With events at the Joseph Page Theatre on the Winona Campus of Saint Mary’s University of Minnesota, as well as at locations across the Winona community, the Page Series offers dance, music, and theatre performances, workshops, classes, and more that inspire, uplift, educate, and invite community members to discover the relevance of the arts in their daily lives. Page Series community programs are made possible, in part, through grants from the Elizabeth Callender King Foundation and the Xcel Energy Foundation.